The team at CarenetLA is happy to support community service whenever possible. It’s part of who we are. Therefore, we are proud to co-sponsor and to promote a blood drive which is being organized by the America Red Cross for Wednesday, September 18th, between the hours of 1-7 PM. 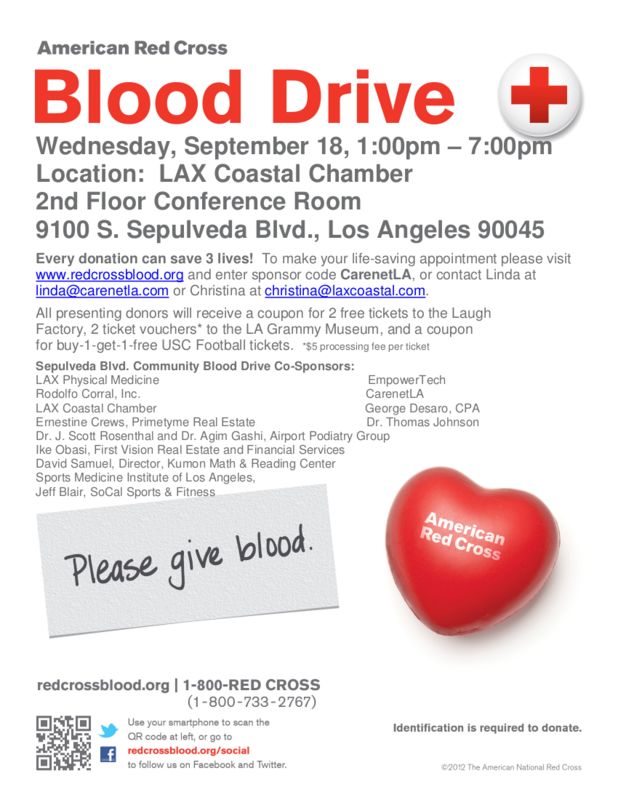 The blood drive will be held in the meeting room of the drive’s main co-sponsor, the LAX Coastal Chamber of Commerce, also located at 9100 S. Sepulveda Blvd., on the second floor. There are many other businesses at this location which will be participating as well. Everyone knows the importance of a steady blood supply. Your help would be appreciated in making this blood drive a success. Donors who are at least 17 years old and up and are in reasonably good health are encouraged to donate. You can register on line by registering at www.redcrossblood.org, or with Christina at [email protected], or by calling 1-800-Red- Cross (1-800-733-2767). All donors will receive a coupon for 2 free tickets to the Laugh Factory, 2 ticket vouchers to the LA Grammy Museum, and a coupon for buy-one-get-one-free USC Football tickets ($5 processing fee per ticket).